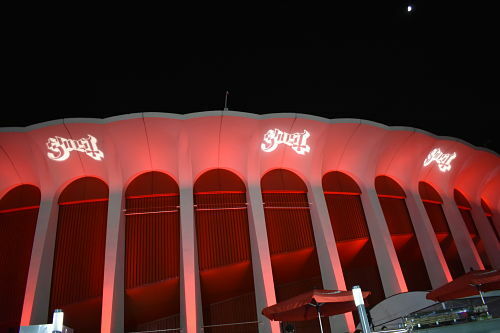 KNAC.COM - Reviews - GHOST In Inglewood, CA With Photos! GHOST In Inglewood, CA With Photos! After being baptized at my first ritual (concert) back on May 5th of this year at the Riverside Memorial Auditorium I became a devout member of the GHOST congregation. November 16th has been marked on my calendar since then so I could attend the band’s first ever arena headlining concert in North America. 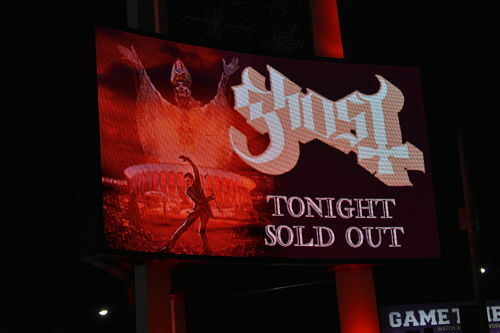 The question is, can GHOST pull off a headlining show with no support band and also keep the crowd engaged? The answer is an astounding yes. With a twenty-six song set list that ran just at about three hours long. 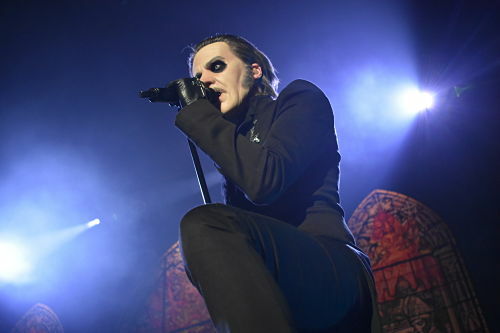 Often at times the crowd was treated to some great comedy between numbers by the ever so talented Cardinal Copia (Tobias Forge). He has a tremendous stage presence, and that is exactly what is needed for this theatrical show that is put forth night in and night out. Until now the band mostly has played smaller venues here in America that have occupancy of around 1,000 to 3,000. Tonight at The Forum would they meet their match at a 17,500 capacity venue? No, not at all. It was a sellout. The floor and seats were jammed packed with people singing along to each and every song. Not only were the congregation dressed in GHOST tour shirts but also many came adorned in Papal robes and make-up that Papa Emeritus I , II, & III would be very fond of. 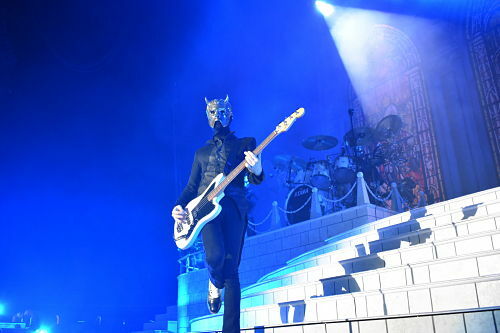 The show opened up with The Nameless Ghouls on stage as “Ashes” was being played. 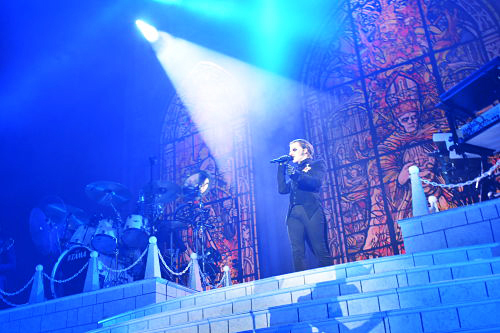 Once Cardinal Copia made his presence known The Forum erupted with cheers and the thunderous drums kicked in and the intro to the biggest hit to date for the band, “Rats”, was played. 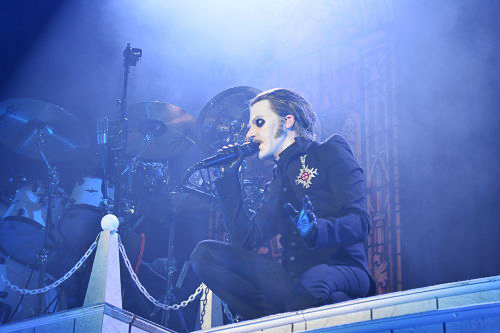 Cardinal Copia knows how to work a crowd and keep them going for the entire show. Even with an intermission between sets the show never came to a lull. The first set added three songs that were not present at the May 5th ritual. They would be “Idolatrine”, “Witch Image”, and finally “Life Eternal” which concluded the first part of the concert. The highlight of the first act was when Papa Nihil enters during “Miasma” and delivers a mind blowing saxophone solo. 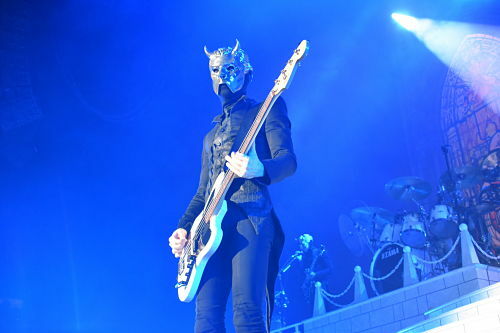 It is a sight that should not to be missed by the eyes of any GHOST fan ever. The second act had all the songs everyone in the audience were clamoring for. From the opening number of “Spirit” to the encore of “Monstrance Clock” the crowd was still going strong. They were throwing their horns up in the air and still singing at the top of their lungs. Two new songs were added in this second act from their last show I saw: “Majesty” and “Satan Prayer”. They are two great songs that need to be on every set list put forth by this band. The highlight of the final act was the entire set. This second set showed why they need to play more arena shows. The use of pyrotechnics was incredible. They included loud explosions with fire blowing upwards and of course a lot of smoke. This gave the crowd a nice warm feeling that we were being summoned to Lucifer’s domain. 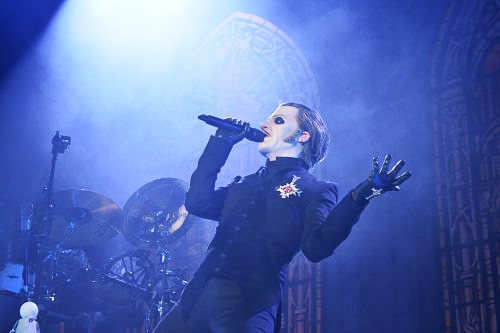 Once again GHOST proves that they belong in the rock world. 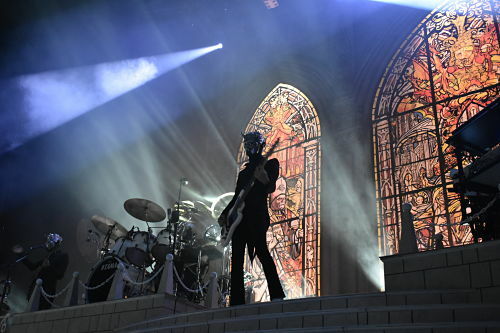 It is time for everyone to join the congregation and pledge your soul to Cardinal Copia and his Nameless Ghouls. "From the Pinnacle to the Pit"